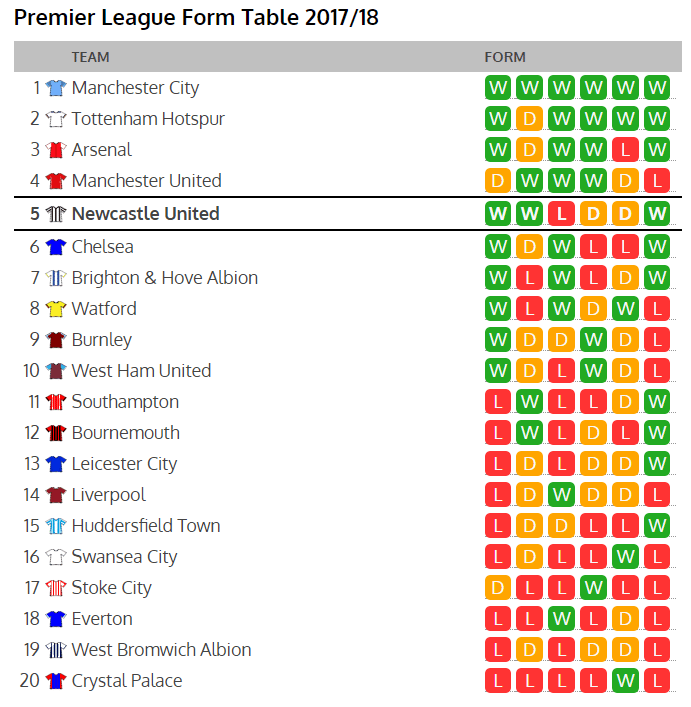 The Premier League recent form table makes pleasant reading for Newcastle fans. Newcastle have actually dropped one place from a week ago despite beating Crystal Palace, with the form table showing the last six games, the West Ham win was dropped off one end and replaced by Saturday’s victory over Roy Hodgson’s team. Newcastle are fifth in this Premier League form table, with 11 points from a possible 18, three wins and two draws, the only defeat being to Brighton. The four clubs above Newcastle also make up four of the top five in the Premier League table at the moment. As for Monday night’s opponents, Burnley are once again proving difficult to beat. They went into Saturday with three wins and two draws in the previous five games but ran into Manchester City, the champions elect winning 3-0. However, it took a controversial penalty to give Man City the lead and then it remained 1-0 until the 73rd minute before two late goals gave the scoreline a harsher look. Last season, only one of the bottom 10 conceded fewer goals than Burnley and that looks set to continue, Sean Dyche relying on a solid defence to give them relative success and safety. With Burnley scoring eight and conceding nine, combined alongside Newcastle scoring 10 and conceding eight, it doesn’t suggest a game full of goals – with 1-1 looking probably the statisticians favourite prediction. With neither manager usually changing their formation/tactics if falling behind an open game looks most unlikely but having said that, no doubt now it will be a 5-5 thriller. With the two clubs seventh and eighth in the Premier League with 14 and 13 points respectively after nine matches, you might guess neither manager would be too upset if they each added a point to their totals. However, both sides will also have an eye on this game as one of their most winnable and thinking that if they score first they have every chance of picking up the three points.